Agile software development approaches have had significant impact on industrial software development practices. Today, agile software development has penetrated to most IT companies across the globe, with an intention to increase quality, productivity, and profitability. Comprehensive knowledge is needed to understand the architectural challenges involved in adopting and using agile approaches and industrial practices to deal with the development of large, architecturally challenging systems in an agile way. Agile Software Architecture focuses on gaps in the requirements of applying architecture-centric approaches and principles of agile software development and demystifies the agile architecture paradox. Readers will learn how agile and architectural cultures can co-exist and support each other according to the context. 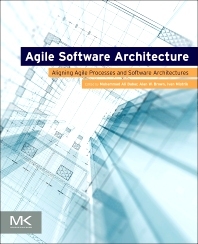 Moreover, this book will also provide useful leads for future research in architecture and agile to bridge such gaps by developing appropriate approaches that incorporate architecturally sound practices in agile methods. Foreword by John Grundy: Architecture vs Agile: competition or cooperation? Bringing the Two Together—Agile Architecting or Architecting for Agile? 2.2 The Vision: What is Architecture? Chapter 5. Architecture Decisions: Who, How, and When? Dr. M. Ali Babar is a Professor of Software Engineering (Chair) at the School of Computer Science, the University of Adelaide, Australia. He also holds an Associate Professorship at IT University of Copenhagen, Denmark. Prior to this, he was a Reader in Software Engineering at Lancaster University UK. Previously, he worked as a researcher and project leaders in different research centres in Ireland and Australia. He has authored/co-authored more than 140 peer-reviewed research papers in journals, conferences, and workshops. He has co-edited a book, software architecture knowledge management: theory and practice. Prof. Ali Babar has been a guest editor of several special issues/sections of IEEE Software, JSS, ESEJ, SoSyM, IST, and REJ. Apart from being on the program committees of several international conferences such as WICSA/ECSA, ESEM, SPLC, ICGSE, and ICSSP for several years, Prof. Ali Babar was the founding general chair of Nordic-Baltic Symposium on Cloud Computing and Internet Technologies (NordiCloud) 2012. He has also been co-(chair) of the program committees of several conferences such as NordiCloud 2013, WICSA/ECSA 2012, ECSA2010, PROFES2010, and ICGSE2011. He is a member of steering committees of WICSA, ECSA, NordiCloud and ICGSE. He has presented tutorials in the areas of cloud computing, software architecture and empirical approaches at various international conferences. Prior to joining R&D field, he worked as a software engineer and an IT consultant for several years in Australia. He obtained a PhD in computer science and engineering from University of New South Wales, Australia. Alan W. Brown is Professor of Entrepreneurship and Innovation in the Surrey Business School, University of Surrey, UK. where he leads activities in the area of corporate entrepreneurship and open innovation models. In addition to teaching activities, he focuses on innovation in a number of practical research areas with regard to global enterprise software delivery, agile software supply chains, and the investigation of "open commercial" software delivery models. He has formerly held a wide range of roles in industry, including Distinguished Engineer and CTO at IBM Rational, VP of Research at Sterling Software, Research Manager at Texas Instruments Software, and Head of Business Development in a Silicon Valley startup. In these roles Alan has worked with teams around the world on software engineering strategy, process improvement, and the transition to agile delivery approaches. He has published over 50 papers and written four books. He holds a Ph.D. in Computing Science from the University of Newcastle upon Tyne, UK.